Summary: It’s Montana in the 1990’s. Cameron Post is 12 years old, spending the day with her best friend. She’s the classic protagonist, a little too quirky and a little too special for her own good, having an amazing afternoon. That very day, her parents die, and all she can feel is relief. Relief that the news wasn’t what she feared, and relieved that her parents would never know that she was kissing a girl hours before their untimely death. Cameron Post is, to be completely candid, not the particularly special character. She’s the carbon copy of every girl in a lesbian romance. How many girls could she honestly get with in Montana at age 14? This doesn’t make her bad per say, but it just means she’s not the new and exciting character you may have wanted. I found much more realism and excitement in her love interest for the first half of the book, Coley Taylor; the cowgirl with a kind heart and a confused soul, whose motivations and mystery made her one of the most incredible love interests in a f/f book in a long time. If only the book had more of her, and less drama with Cameron’s aunt. Of course, since this is a book about young lesbians there has to be the drama of everyone finding out, and the second half of the book is set at a de-gaying camp. We spend a bit too long here, but I still applaud the slightly different approach Emily Danworth took going here. Again, the characters Cameron interacts with are far more interesting then Cameron herself, particularly her roommate, a girl with a interesting new personality and mysterious motivations. The novel checks out every trope of a f/f novel, and while it is beautifully written and a very enjoyable ride, this book isn’t anything too special. I still recommend this to anyone who wants a exciting journey through the life of Cameron Post, and whose already checked out every other f/f book in the library. 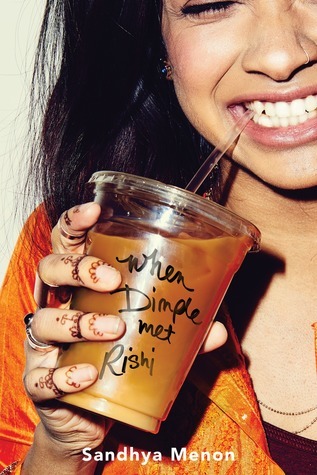 Summary: Meet Dimple Shah. She just graduated high school and is ready to start proving to her tradition loving Indian parents that her future lies in coding and college- not marriage and tradition. Above all, she wants her parents to understand that an arranged marriage has no place in her life…ever. Considering her parent’s-particularly her mother’s- view on the necessity of a good Indian marriage, Dimple is shocked when they readily agree to her request to attend a prestigious summer program for aspiring web developers. The program will give Dimple a chance to get a leg up on developing her own app and put her in the running to win a chance to meet and collaborate with her idol app developer Jenny Lindt. Now meet Rishi Patel. He also just graduated high school and comes from an Indian family deeply seated in tradition. However, Rishi embraces those traditions and looks forward to the day he is matched with a traditional Indian bride. With that in mind, despite almost no interest in web development, he accepts his parent’s proposal to participate in a summer coding camp that will allow him to meet the girl his parent’s hope to match him with, Dimple Shah. When one person thinks they are meeting a potential partner for life and the other person thinks she is there to get a head start on an education and career opportunity- but instead finds out she is being manipulated by matrimony-obsessed mother- how can you expect anything but disaster? It may sound like it, but sometimes love works in unexpected ways. Who will like this book? : There’s family, tradition, friendship and love all wrapped up in a tidy package in this book. So, high school and older readers who are looking for a fun summer beach read-for the fall or winter will certainly enjoy it. Where can I find a copy? : Paper copy available at Fairfield Public Library, Digital copy downloadable from Overdrive through Fairfield Public Library, and audio copy downloadable from Hoopla through Fairfield Public Library. Summary: Four girls, Apple, Erin, Isabel and our narrator are as different as can be, but they are united by their undying devotion to the world’s most popular, if only marginally-talented, British boy band, the Ruperts. Incredibly, just before a big show in Manhattan, the intrepid super-Strepurs (a fandom name derived from spelling the band name backwards, of course) find themselves in a position that any fangirl would envy: Alone in a hotel room with one of the boys. The problem is he is there against his will, sort of kidnapped and tied to a chair, with everyone in the Ruperts’ universe looking for him, from his fellow singers to his stylist to his girlfriend to the hordes of fans jamming the streets outside the building. As the girls sink deeper and deeper into the mess they’ve made, cracks in their bonds begin to show, proving that people are not always what they seem to be, and that maybe you can never truly know anyone, even your best friends. This fast-paced, smart and hilariously funny story is part mystery and part an examination of the ups and downs (and downright insanity) of being part of a fandom. The language is blunt and at times profane, the reality of the situation is bizarre and often dire and the pages practically turn themselves, revealing ideas about fandom, adolescence and life itself that are more profound than can be described without spoilers. Put this at the top of your too-read list! Who will like this book? : Fans and stans. Mature readers who like twist-and-turn psychological mysteries, and stories with potentially unreliable narrators. Anyone who has ever worshipped a boy band. If you like this, try this: Born to Rock by Gordon Korman. Fangirl by Rainbow Rowell. The Haters by Jesse Andrews. I am (not) the Walrus by Ed Briant.